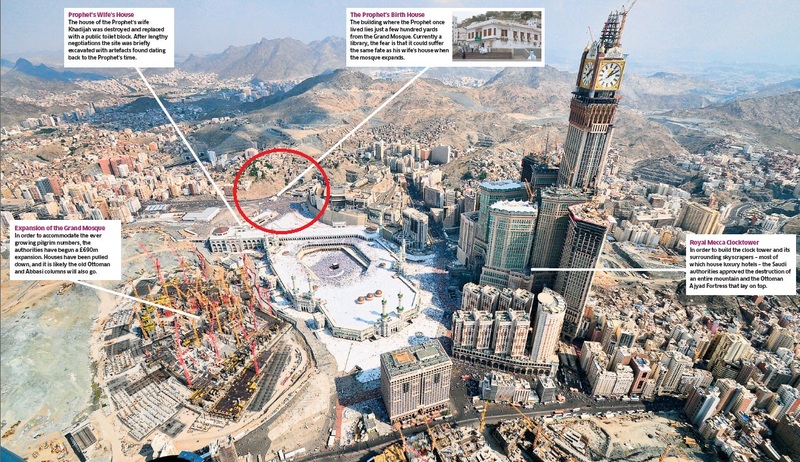 JNN 23 Feb 2014 Riyadh : Fresh plans are being drawn up to erect a modern complex on the site of what scholars of Islam contend is the birthplace of Prophet Mohammad as part of a sweeping multi-billion-dollar redevelopment of the pilgrimage city of Mecca that has already ravaged many sacred sites and structures. If approved, the project, details of which have been obtained by The Independent, would entail the demolition of a small library steps away from the Masjid al-Haram, or Grand Mosque, which sits directly on top of what are believed to be the remains of the house of the Prophet’s birth. According to IRIB World Service, the rush to transform Mecca at a cost of tens of billions of dollars into a shiny metropolis of skyscrapers and hotels, and the giant expansion of the mosque itself to accommodate ever greater numbers of pilgrims continues pell-mell with scant regard for archaeological preservation of any kind. According to the Independent, the Ottoman-era columns in the mosque bearing inscriptions pertaining to the Prophet have been toppled, while the house of his wife, steps from the library, is the site of a giant toilet block. Dr. Irfan al-Alawi, a historian and executive director of the UK-based Islamic Heritage Research Foundation said that for critics, the destruction of the Mawlid House would be the final straw. He added that the last remaining historical site in the kingdom is the birthplace of Prophet Mohammad, probably the most important site to the Muslim and Shia community around the world and most people are not even aware there are plans now to destroy it. This entry was posted in Middle East and tagged IRIB World Service, Islamic Heritage Research Foundation, Mecca. Bookmark the permalink.